Scam holiday rentals for ski chalets are sadly not uncommon. Understanding how they work helps you to avoid being a victim. This advice is from my point of view as a British owner of a chalet in Chamonix, France, but of course much of this is generally applicable. 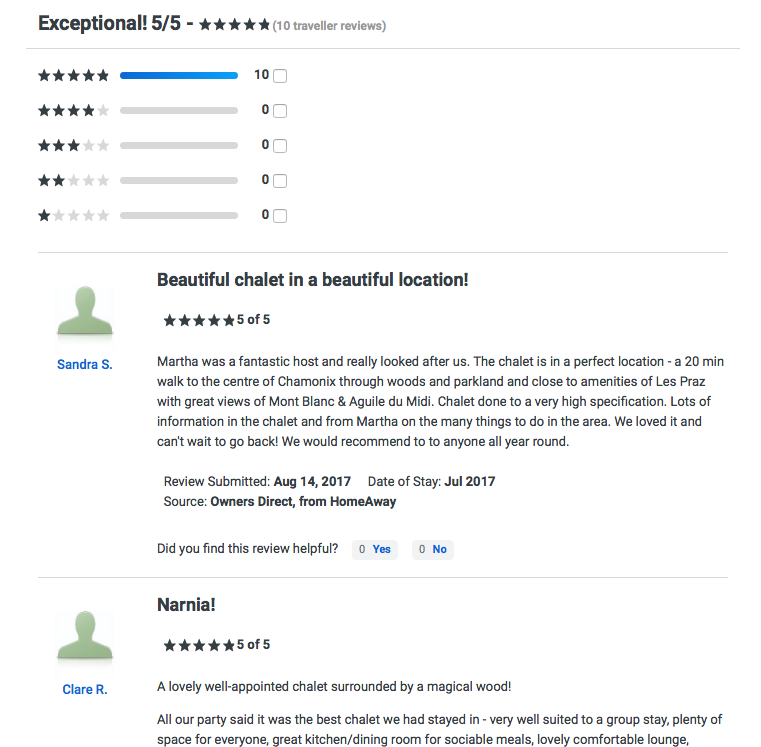 Using photos taken from the internet to make a fake chalet on an established booking site. Can be avoided by: Checking presence online and on social media, plus contacting the owner via telephone and asking a few questions about the chalet and area. Creating an entirely fake ‘agency’ site. Book only with well established agencies. Verify their registrations and that they have been in business some time. Talk to someone at the agency on the phone. Hacking an owner’s email or other details on an established booking site. “…the victim of what’s called a “secondary” phish — that is, the property owner’s email account had been hacked. After breaking into the owner’s personal email account, the scam artist communicated with Hutt and diverted her payments into his bank account.” VRBO’s so-called Carefree Insurance refused to cover this, claiming it was out of their control. Can be avoided by: Checking the phone number posted is consistent across sites, contacting the owner via telephone and asking a few questions about the chalet and area. One factor that makes these scams very attractive to criminals is that the peak weeks – especially New Year and Half Term – are hugely oversubscribed, especially in popular resorts. I would estimate I get about fifty enquiries annually for New Year, despite it being marked as booked on our site. And these weeks are the most expensive of course. It’s also very difficult to police. I’ve reported several scams to actionfraud.police.uk but never heard back from any of them, even when reported with bank details of scammers. Typically, you might have a client in Germany, a scammer in Romania, a property owner in the UK and a chalet in France… difficult to co-ordinate against, and to say where exactly the crime occurred. So it’s very attractive to criminals. It’s true that booking via an ABTA travel agent guarantees your entire holiday. However, many people – myself included! – much prefer the more individual, flexible and less expensive approach of booking their own accommodation direct with the owner. It’s often recommended to use a credit card to pay so that you are covered via their insurance. This is true, but if you’ve shown up in a family group of ten in Chamonix on the arrival day before New Year, the refund for accommodation, when it eventually arrives, is not going to even remotely cover the expense and stress. And most travel insurance won’t cover you for fraud. So always do some ‘due diligence’ on your chosen accommodation, even when booking by card, to avoid this happening to you. And always exercise more care when booking these popular weeks. Even if I’m just booking for the two of us and the dog, for a single night, I will do the basic minimum of checking out the date a place has been advertised from, and the dates of its reviews. The larger the holiday and therefore the amount of money, the more I will do. It really doesn’t take long and it’s so worth it for the peace of mind. The speciality of these scams is often availability of a very high standard chalet (photos can be stolen from anywhere, so they generally steal the best) at a very good price for a hard-to find week like New Year. Any particularly good deal should inspire a very thorough check. These tips also apply to agencies. There have been a rash of short-lived fake ski chalet agency sites in recent years. Check an agency in the same way you would check an individual chalet – the fake sites tend to be short-lived so look for a well-established web presence and check agency registration numbers carefully. If the chalet has a name, put this into Google and search directly. You should find the same name and contact details across multiple sites. Have a look at the chalet’s location on Google Maps – does it match what you are expecting? Check for a presence on social media, and check how long these have been active for. Look for regular updates, interactions and reviews. Use Google reverse image search to check pictures of the chalet – do they appear under another name elsewhere? Ideally the chalet will have its own site. Put the domain name into the ICANN registry to check the registration and the dates. If the name and contact details on the registry match the ones you are contacting, and the site has been registered for over a year, you can feel pretty confident about the legitimacy of a business. A ten year registration especially inspires confidence! Here, for example, you can see our info – we have had the chalet domain since 2006, and began a ten year registration in 2008. Do note that contact information that doesn’t match the owner’s name is not a red flag. Some people hide them for privacy, and some people get someone else to deal with all this for them. However a one year registry on a recent domain without matching contacts would make me want to do a lot of extra checking, as would contact information in an unexpected country. Don’t be put off by this appearing a bit technical! It’s not at all difficult and an excellent check to make. Large and established sites are not necessarily a guarantee. There are a lot of fake listings on established sites. But don’t the big sites offer a guarantee? Yes…but it may not always cover you. Stories of them wriggling out of covering loss abound. And as with the credit card guarantees above – they won’t recompense you for the stress and potentially very large expense of finding new accommodation. On most of the major sites, you’ll see how long the owner has been advertising. If they’ve been on the site for over two years, this is an excellent indication. And also TripAdvisor. TA’s ranking system for reviewers is a handy extra confirmation here – it makes it very clear that the review is genuine. Check the availability calendar too. If it is suspiciously empty, that is something of a concern. Scammers leave all dates open to maximise potential enquiries. Of course some chalets will genuinely be new to the site. But I would definitely do further checks in this case. Another thing to check before you book is that the website is definitely the one you think it is! There is an unpleasant trend of cloning large and well known sites. I have seen a scarily accurate AirBNB clone that was actually being hosted on a hacked gas supplier’s website in Brazil! Check every letter of the address. The same goes for communication. All these sites will send you emails with buttons to reply. They are easy to fake, resulting in you entering your details into a cloned site. I never use the buttons as this is a risk for owners too. Go to the site in your browser, and log in there. This applies to all sites by the way – not just holiday ones. it’s a good general practice. Contact the owner with a few specific questions about the area and location, you should get an enthusiastic and knowledgeable answer. The same advice applies – and once you have booked and paid your deposit, you should expect to be put in touch directly with the owner. As with a larger agency, check these contacts and use them! In some cases, the agency also operates the chalet itself, in which case all the advice I have given for the owner applies to the agency. Always contact the owner via the site’s system with a few specific questions about the area and location, looking for the same thing as above – an enthusiastic and knowledgeable answer. Here’s our profile for an example. Again, if the chalet has a name, put this into Google and search directly. Muddying the waters here, some chalets are listed under different names with different agencies – check this with the owner if you are concerned, by asking them which agencies their chalet is listed with. Most importantly, double check, once you are booked. Once a booking is made on the big sites, the direct contact details of the owner will be passed on to you. Check them, and use them! Make sure they are the same that the owner has posted in other places, and call them for a quick chat. This is the best way to avoid getting caught by a phishing scam. Most owners are delighted to answer questions. Again, ask about practicalities and if you sense that anything is not right, contact the booking site with your concerns. You can also put the phone number and email that you’ve been given into Google. 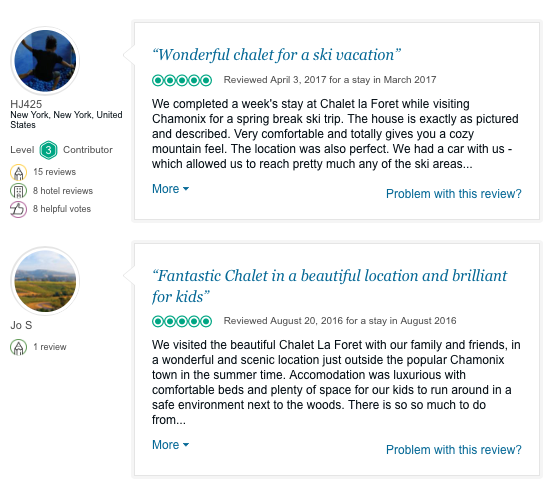 It should return lots of listings for the same chalet, or if you already know it is a booking agent, of course it may return for other chalets and the booking agency. Asking for a landline number used to be a regular verification technique but really these days I’m not so sure it’s useful. If there is one posted, you can check that the area and country code make sense with the other contact details . What if they don’t accept credit cards? I would never pay an agency via bank transfer, but there are still some chalets that don’t have credit card facilities. It isn’t necessarily a red flag but it is something to be very cautious around. Some chalets are run by people who are not very comfortable with the technology. Accepting cards opens the owner up to scams too, and many owners are justifiably wary of this. Some have been doing business on the big listing sites for years, taking payment by bank transfer and are understandably reluctant to be forced to use a big site’s own payment procedures, losing control of their cash flow. If all other verifications check out well – long standing online presence, good reviews over many years – and I have have had a good chat with the owner, I am happy to pay by transfer but it’s vital to check the bank is where they say it is. This is very simple – just use an IBAN checker such as this one. In every bank transfer scam I have encountered, doing this would have prevented it. Typically in a scam, the bank details are given as being a well known bank in France or the UK. But on checking, they prove to be an account in a different country. The details may occasionally come up with the name of the nearest large town of course, if that is where their branch is. But it should definitely be in the same region. If I’ve spoken to the owner and the IBAN checks out, I would not be concerned at all about paying direct. These scams aren’t run by people based in the same area or even the same country. If the account is based in a different country (i.e. not that of the property) then it may be perfectly legitimate but I would not pay by transfer and I would want a very good and independently verifiable explanation before booking at all. This all sounds like a lot of work but when you are parting with a lot of cash for a big chalet at a peak time, it is really well worth a thorough check. And don’t just check these before you book! Many bookings are made months or even years in advance. Connect with the chalet on social media, or at least check their accounts. Or drop them an occasional email with a question for your planning. Always check the online and social media presence and reviews before parting with any money. If in any kind of doubt, pay only by credit card. Always speak to the owner in person, and ask lots of questions.